Since the release of VMware vCloud Air, the various use cases coming up have been growing like weeds. The more people understand the VMware vision of the hybrid cloud, the more things people think of they can do with it. This example is no exception and as with my other short posts, this is just the start of the idea for a larger paper I will put together with more details. The scenario is very simple and real for many people using VMware vCloud Air. The basic concept is this. You have setup multiple vCloud Air clouds. In the case of the diagram below you have a Virtual Private Cloud and a Dedicated Cloud which happen to be on the opposite geographical coasts. The idea now is that you have a web application with a web-based front end that you want to have not only load balanced within each of the virtual data centers, but also globally. There is other solutions out there as well, but DYN was nice enough to let me test this idea out with theirs. In order to do this you can combine both the native included VMware vCloud Networking and Security Load Balancing solution and the DYN Traffic Director. The solution is extremely simple and also very effective for layered redundancy and traffic serving. The logical diagram above is what you end up with at a high level and here is what you end up with. You establish a Virtual Server IP using one of your vCloud Air External IP’s on your Edge Gateway. You deploy as many web servers on a routed network you need in that Virtual Datacenter and add them to the Server Pool in the native vCNS load balancer which is included with your vCloud Air account. Once that is completed you will have a single data center with load balanced web servers. Now you can copy those servers using vCloud Connector, or spin them up from scratch in the other Data Center and do the same thing. At this point you have your web servers redundant and load balanced in each separate datacenter, and now the DYN Traffic Manager magic happens. 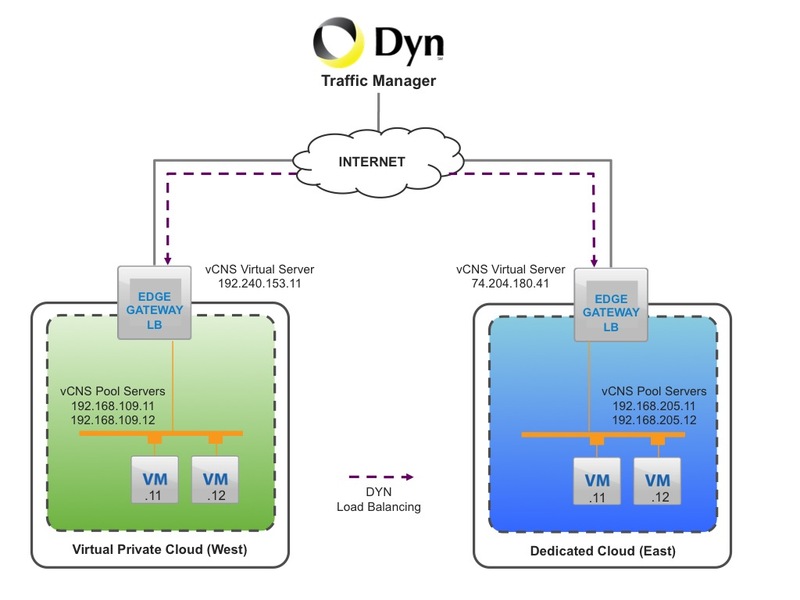 With DYN Traffic Director, you can create a new DNS Zone, create a new Traffic Director service node and assign the vCNS Virtual Server Addresses to the global pool in the DYN Traffic Manager service. Effectively you are load balancing to load balancers which is actually a fantastic solution. You get the best of both worlds with the load balancing globally on the DYN service, along with the intra-datacenter load balancing. I cannot tell you how their Traffic Manager actually works right now, because I am not even sure. I just know it does work and is something additional to their native DNS offerings and so far a cool service. You also get multiple levels of monitoring, and since the vCNS Edge is deployed in an HA pair you have a lot of built-in redundancy. Of course this does require that your Domain and records are hosted in a DYN account for name server resolution. I have actually set this up on a small test scale for the smoke test and I plan on having a more permanent demo of it when I write the full paper that I can show live in VMUG and other presentations. I think as more people start to think creatively and outside the box on how to build applications and run them in the VMware Hybrid Cloud Service, you will see the possibilities are endless. If you want to see the smoke test just go to http://www.vcdx.co and refresh a couple of times within a few minutes. You should see the server change eventually from the VPC to the Dedicated apache servers or vice versa. I still need to look into their caching and “Sticky” options before I go to the next level.